The city held a public hearing about the planned improvements to the path on February 13. On January 30, the Hinsdale selectboard voted to approve a proposed solar power plant that would generate enough electricity to power more than 20,000 typical homes. It still needs state approval. The panels would go on a farm field. 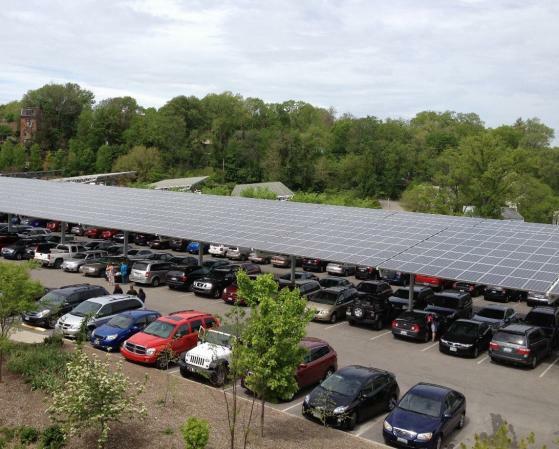 Last year, the state of Vermont announced it would begin helping to pay the cost of solar panels installed on rooftops, and in other “preferred locations” like abandoned gravel pits and on structures built over parking lots (see photo), rather than solar panels built on farmland. As of 2015, the state with the most solar power per person was Nevada. Number eight was Vermont, followed by Massachusetts. New Hampshire was not in the top 10.